Introducing AirBrands Event & Marketing Group, a sister company to Dynamic Displays dedicated to the creation of custom inflatable pieces for clients across the globe. Experience the superior impact and versatility of custom inflatables, uniquely crafted to suit your corporate needs. Reduce your carbon footprint and reinforce your company’s commitment to eco-friendly operations with displays that pack down to 10% or less than their inflated size, making storage and shipping more economical than ever. 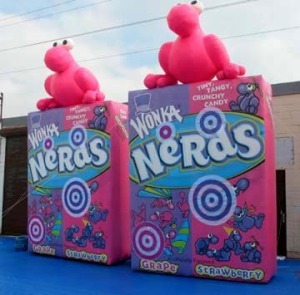 Wonka Candy Inflatable Nerds Boxes, an interactive display inviting visitors to compete by hitting velcro targets. When it comes to intricate shapes and imaging, the sky’s the limit with custom corporate inflatables. Brands like Chevy, Willy Wonka Candy Company, and Yoplait have worked with the AirBrands creative team to create high impact, visually stunning advertising campaigns. AirBrands’ team of artists uses a combination of digital printing, expert pattern design, and airbrushing to produce product replicas and characters that are true representations of your brand and company. 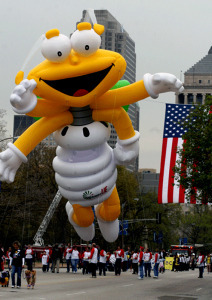 Louie Lightning Bug, corporate mascot for AmerenUE, an electrical company serving the midwest. Louie is a permanent fixture in St Louis, MO parades year round. Reinforce your brand’s approachability and put some friendly faces to your business with custom parade inflatables. Brands like Ameren UE, WestJet Airlines, and Vera Bradley have successfully used giant helium balloons to connect with their customers in a unique way. Parade inflatables staffed by company employees are a great way to create fun consumer memories strongly associated with your corporate brand. Our top-notch production service isn’t the end of the line—we also offer complete service packages for companies that want a completely hands-free experience. Our corporate service packages include a trained, professional technician who will transport, set up, and supervise your custom balloon through any parade route, in any city. After the event, your unit will be returned to our shop, where we’ll clean it and make any necessary repairs, then pack it away safely until your next use. All you have to do is provide balloon handler volunteers and tell us where to go next!